Walter O’Malley and the Dodgers made history in 1958, along with the Giants, as they expanded baseball’s borders to the virgin West Coast territory. 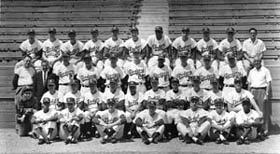 The significant relocation by the Dodgers to Los Angeles and the Giants to San Francisco literally put Major League Baseball on the map, as previously the St. Louis Cardinals represented the ballclub which was farthest west in the National League. This expansion of territories later enabled additional baseball teams, such as the Los Angeles (1961-64)/California Angels (1965), Oakland Athletics (1968), San Diego Padres (1969), and Seattle Pilots (1969) to populate the West Coast, bringing millions of fans the enjoyment of the major leagues. The Dodgers made a big transition playing in unfamiliar and unusual conditions at their new home, the Los Angeles Memorial Coliseum, which O’Malley leased until his “dream stadium” could be built. The odd-shaped baseball diamond had a left field fence of only 251 feet, but a 42-foot high screen was installed to make it a more difficult target. Straightaway center field was 425 feet, while right center tapered off to 440, an unusually long dimension that caused players like Duke Snider’s power numbers to dwindle. After hitting 40 or more home runs in each of the previous five seasons, Snider managed only 15 home runs and 58 RBI in Los Angeles. Roy Campanella, who had been a stalwart of the Dodgers as three-time N.L. MVP catcher, was paralyzed in an automobile accident on Jan. 28, 1958 when his car slid off an icy highway and into a light pole. The accident finished the 10-year career of Campanella, who was fortunate to live, as he suffered two fractured vertebrae while totaling his car. The Dodgers opened the season with a three-game series in San Francisco’s Seals Stadium. In the first major league game played on the West Coast, the Giants blanked the Dodgers, 8-0. The players had some trouble adjusting and could not get out of the starting gate in Los Angeles, despite drawing large crowds in their new home. Following a huge welcoming parade in downtown Los Angeles and on the steps of City Hall, the Dodgers beat their old nemesis, now the San Francisco Giants, behind Carl Erskine in the first National League game in Los Angeles, 6-5, on April 18 before a major league record 78,672 fans at the Los Angeles Memorial Coliseum. San Francisco’s Hank Sauer hit two home runs in the game, the first in the Coliseum. Newcombe struggled on the mound, dropping six straight games and he was traded to Cincinnati. Drysdale rebounded to finish 12-13, after starting the season at 1-7 and with some trepidation about pitching with the short left-field screen. Clem Labine had a 6-6 record and 14 saves (second in the N.L. ), while Johnny Podres was 13-15 with 143 strikeouts, tied for third best in the league. Sandy Koufax was 11-11, but gave up the league’s second fewest hits per nine innings at 7.49. 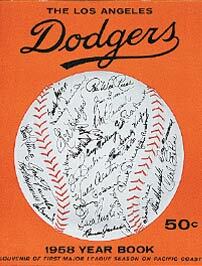 The normally dominant Dodgers slipped all the way to seventh place in 1958, with an aging and transitional ballclub. Hodges hit .259 with 22 home runs and 64 RBI, but found leaving his Brooklyn home a real challenge. Reese would play in his final season in 59 games at age 40, but it would be the end of an era for the Captain who had brought so much professionalism and prominence to the Dodgers. On April 27, Walter O’Malley announced that the Dodgers would televise the season’s remaining road games (beginning on May 9) from San Francisco on KTTV Channel 11 in Los Angeles, reversing an earlier policy of not televising away games. It was the beginning of a partnership with KTTV that lasted through the 1992 season. 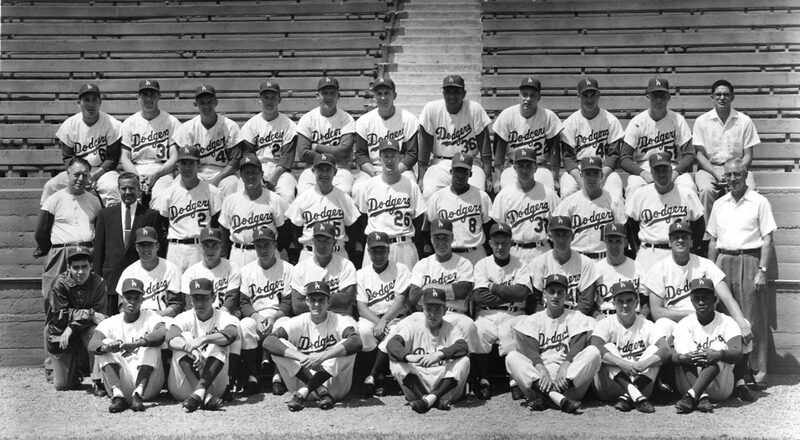 On June 3, Los Angeles city voters passed a referendum, “Proposition B,” which ratified the city’s agreement previously made with the Dodgers on Oct. 7, 1957. The important referendum, which was supported by nearly every type of industry in Los Angeles, meant that O’Malley could proceed with his plans to privately build Dodger Stadium. It was Walter Alston’s lowest finish since he started managing professionally in Portsmouth, OH in the Class-C Mid-Atlantic League in 1940. Changes would have to be made for the 1959 campaign and the most significant one was when Executive Vice President and General Manager Buzzie Bavasi traded for Wally Moon, an outfielder with the St. Louis Cardinals. 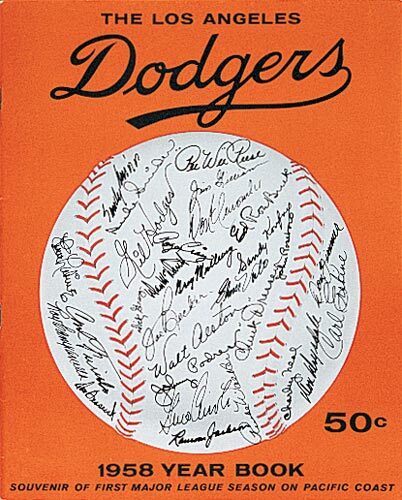 Click image for a larger view1958 Dodger YearbookCopyright © Los Angeles Dodgers, Inc.
Click image for a larger view1958 DodgersCopyright © Los Angeles Dodgers, Inc.